Nathaniel Lande, is an author, journalist, and professor, and former creative director of Time Magazine, originally from Canada. Lande was educated at Duke and Oxford Universities. He was educated at the Avon Old Farms School, Duke University, Oxford University, and earned his doctorate at Trinity College, Dublin. While a "Yank at Oxford", he and two classmates won an ARTS Council Award for their musical comedy, A Word With the Governor, a satire about the British Colonial Office. The play opened to rave reviews at the Oxford Playhouse, and then enjoyed a limited engagement at London's Lyric Hammersmith theatre. As a professor, he has held appointments to the School of Journalism at the University of North Carolina in Chapel Hill; the Fuqua School of Business at Duke University, and Distinguished Scholar to Trinity College Dublin. His accomplished career spans publishing, television, and films. Creative Director for the Magazine Group, TIME Incorporated;, Director of Time World News Service, a Founding Director of TIME-Life Films; Executive Producer for both the CBS and NBC Television Networks; Producer/Director : Movies of the Week: CBS Cinema Center Films and Universal MCA. At CBS he began his career in the mailroom, and soon was selected by the legendary Michael Dann and William Paley, to work for the head of Programming. Then he joined the producing staff of PM East, hosted by Mike Wallace, with his good friend, Peter Lassally, (who would later become producer of the Tonight Show at NBC). By night, the young and enterprising producers searched for talent discovering Woody Allen at the Bon Soir, a small club in New York, and Barbara Streisand at One Fifth Avenue, and were the first to book them on national television. 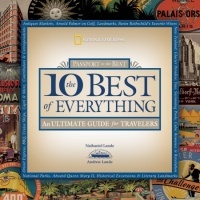 National Geographic Books The Ten Best of Everything: Passport to the Best, An Ultimate Guide for Travelers. is a joint effort between Lande and his son. Montage and Window on the World, are two of the films and documentaries Nathaniel Lande wrote, produced and directed at TIME, winning over Twenty Gold Medals and International Awards, including the New York and Cannes Film Festival With Gregory Peck, Nathaniel Lande served as a special White House aide under two United States Presidents. Part of his duties included producing White House events. His productions of A Salute to Congress and a History of Presidential Campaign Songs called Sing Along with Millard Fillmore, staring Walter Cronkite as narrator, delighted the Congress. The holder of two patents he is credited for creating the Electronic Book and the Bookbank, a computerized electronic storage and retrieval system. Toward the Electronic Book, Publishers Weekly September, 1991. Another innovation was adapting a motion stabilizing system to motion picture cameras, a technology used for gunnery sights on helicoptors during the war in Viet Nam, he found on assignment while making a documentary for LIFE Magazine on Helicopter Warfare with the award winning photographer, Larry Burrows, who was killed shortly after in Cambodia. The lens won an Academy Award for Technology. He is author of eight books including a novel. His notable book Cricket is partly autobiographical, a coming of age story and triumph over a childhood handicap. Both he, and his central character Jonathan Landau, could not speak for the first nine years of their lives. Both the real Lande and fictional Landau made significant contributions to the first Special Olympics. His other works include National Geographic The 10 Best of Everything, An Ultimate Guide for Travelers, Cricket, New American Library  Blueprinting,; the highly acclaimed, Dispatches from the Front: A History of the American War Correspondent: Oxford University Press ; Mindstyles-Lifestyles: Price Stern and Sloan  ; The Emotional Maintenance Manual, Stages, Harper and Row , Self-Health: The Life-Long Fitness Book, Holt, Rinehart Winston; The Moral Responsibility of the Press, Time, Inc. and The Cigar Connoisseur, An Illustrated History and Guide to the World's Finest Cigars, Clarkson Potter. Nathaniel Lande served as a special White House aide under two United States Presidents. He was married to Linda Hope, daughter of Dolores and Bob Hope. They have one son, author Andrew Lande, an expert food and wine writer and a journalist. He lives in Montecito, California and New York, and is presently married to Natalya Chamkina, the noted Russian ballerina. "A dynamite read . . . Should be in every war correspondent's past, present and future kit bag." -Colonel David A. Hackworth, correspondent for Newsweek and author of About Face. "Beautifully written . . This masterful collection is for anyone who appreciates good writing and loves journalism. It is a moving account of our republic that honors the best in our profession." Dispatches From the Front is a first rate book about the men and women who reported the gallantry, the raw courage and the horror of America's wars. Nathaniel Lande is both a teacher and a scholar in his vivid account of these correspondents, who became opinion makers helping to shape an emerging nation." -William Friday, President Emeritus, University of North Carolina at Chapel Hill. “An extraordinary, sensitive novel…thoughtful…extremely moving…a powerful testimony to courage and faith." " Heart warming and heart breaking. A novel you will treasure." “A rich dreambook for those of us still waiting for our own ships to come in. Loggng over 4,000,000 miles, and compiled by veteran travelers Nathaniel and Andrew Lande, this extravagantly entertaining volume has historical and literary journeys, a whole host of trips and expeditions for any taste and to every continent including Antarctica, each complete itinerary a unique variation upon the theme of the 21st century Grand Tour. Highlighted with vintage posters and color illustrations, cosmopolitan sidebars, engaging personal narratives, and famous contributors and correspondents, sets the book apart from any other travel book. Savvy tips, with a wide array of detailed information on luxury hotels, resorts, restaurants, and more, this elegant and sophisticated treasury of travel lore will awaken the wanderlust in readers everywhere”. "Mr. Lande's life is just as extraordinary as The 10 Best of Everything with lists, vignettes and reproductions from his vintage poster collection that are sprinkled throughout the book. How else does one describe a man whose father took him as a young boy to China and India and crossed the Khyber Pass into Burma, who plays Polo with the world class players in Argentina, who was taught to tap dance by Tommy Tune, who was married to Bob Hope's daughter and is now married to a former Russian ballerina, who was a college professor, who worked with Mike Wallace, Walter Cronkite and Gregory Peck?" -Marilyn Mahon, Santa Barbara News Press, May 21, 2006. ^ The National Archives. Washington, D.C.
^ TOWARDS THE ELECTRONIC BOOK: Publishers Weekly, New York, September 1991 Patents held by Nathaniel Lande for the Electronic Book and Book Bank: : United States Patent Office, Washington D.C. Patent Number: 07/948-978 Reel 6-2-99 Frame 0996 Reel 6-3-16 Frame 0935. ^ THE MORAL RESPONSIBILITY OF THE PRESS, MONTAGE, WINDOW ON THE WORLD: TIME, Inc. Archives: Rockefeller Plaza, New York. ^ THE CIGAR CONNOISSEUR: Clarkson Potter an Imprint of Random House New York: 1997 ISBN ISBN 0-517-70846-9 A Letter From The Publisher, TIME Magazine April 16, 1984: Nathaniel Lande, Director of TIME World News Service, TIME, Inc. New York. This page was last modified on 5 November 2009, at 19:49.